Jonas Knudsen has rejoined the Danish World Cup squad ahead of their clash with Australia today, which kicks off at 14:00 on TV2, after leaving over the weekend to attend the earlier-than-expected birth of his daughter. 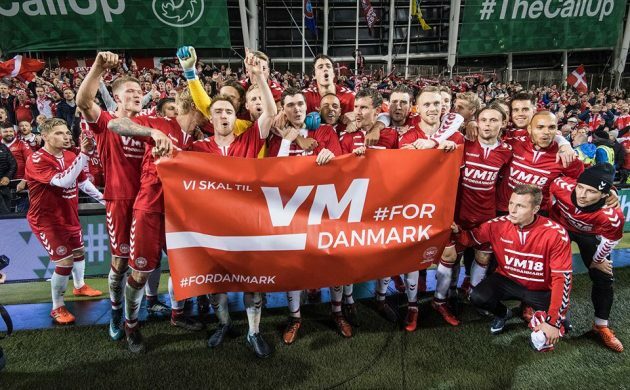 Thanks to the generosity of his team-mates, Knudsen was able to catch a private plane to Denmark after his side’s 1-0 defeat of Peru on Saturday. Unlike some of his team-mates, the Ipswich Town left back does not play for a top-flight club, so it’s unlikely he could have afforded the plane without the gesture. Denmark will have to play the rest of its World Cup campaign without long-serving midfielder William Kvist. A first-half challenge in which Peruvian striker Jefferson Farfan rose high to place his knee in the FCK player’s torso resulted in two broken ribs and a punctured lung. Kvist tried to play on, but had to call it a day shortly afterwards. Lasse Schöne, who replaced him, looks likely to retain his place in the line-up against Australia in an otherwise unchanged starting 11. Meanwhile, opponents Australia could hand a start to 19-year-old wonderkid Daniel Arzani, who failed to impress in his ten minutes against France, but recently scored his first international goal in a pre-tournament friendly. A great ball carrier, Arzani has the potential to be a world star. Denmark’s odds to win the World Cup have been shaved down from 100/1 to 66/1, although 80/1 is still available at various bookmakers. The shortening reflects the increasing likelihood that Denmark will make the knockout stage following their defeat of Peru, their main rival for the second spot behind France. Denmark are generally even money to beat Australia today and 10/3 to top the group ahead of France. Judged by its results on grass, the current Superliaga champs FC Midtjylland would appear to have had a successful decade, as not once has it failed to finish outside the top six. But on paper, it is a different story as it has failed to make a profit since 2008, making a collective loss of 189.2 million kroner in its last nine years. In contrast, Parken Sport & Entertainment, the owner of FC Copenhagen, could not be doing better. Last year, it made a 40 million kroner profit to top the Superliga rankings, and Silkeborg IF (14 million), AaB (12.8) and FC Nordsjælland (5.4) also had healthy results. Elsewhere, though, the clubs finished mostly in the red, with AGF (-9.2), Lyngby (-11.7), FCM (-14.0), OB (15.5) and Brøndby (-24.8 ) among those declaring sizeable losses. Overall, the clubs made a collective loss of 6 million kroner, down from a profit of 4 million in 2016.